Can Anyone Knock Facebook and Google off the Top Spot? With Twitter’s growth seemingly exhausted and new players struggling to build market share, the two biggest giants of digital advertising seem unassailable. It’s fair to say that the staff at Twitter has had a rollercoaster couple of years. But perhaps the worst trouble happened in February, when its Q4 2016 earnings report was considered the worst in its already eventful history. The company’s revenues had increased just 1% to $717 million. As a result, the company’s stock price fell sharply. Based on its recent performance eMarketer predicts Twitter’s share of the US mobile advertising market will fall from 2.6% to 2.0% this year, dropping to 1.4% in 2019. That’s bad enough, but it comes at a time when Facebook and Google are increasing their already dominant share of the advertising market. up 15.9% on 2016, which was already the first year where digital’s share of the advertising budget exceeded television. The vast majority of this will be carved up between Google and Facebook, who are expected to account for 60% of the total spend – that’s more than $50 billion between them. 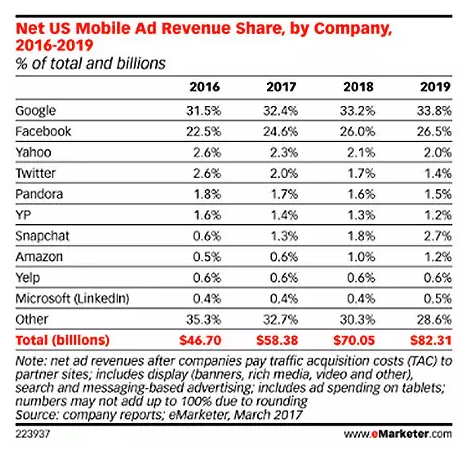 It’s a similar picture with mobile advertising, where Google and Facebook are expected to capture 57% of the $29 billion mobile ad spend. As this chart from eMarketer shows, the gulf between these two dominant companies and the rest is huge. Although Twitter is ranked fourth, its predicted income is barely a tenth of Facebook’s, and even less compared to Google. So who from the chasing pack has any chance of success? There was an instant backlash in India, where many people uninstalled the app and left angry one star reviews on the app stores. Spiegel denies the claims, and it’s likely that this is all just a storm in a teacup. However, it shows how quickly public sentiment can turn against a company that relies on being seen as cool and in touch with its userbase. Snapchat’s strengths lie in display ads. 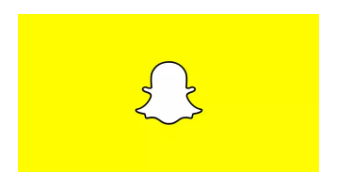 eMarketer predicts that Snapchat will make $800 million in revenue from display ads in 2017, rising to $1.3 billion in 2018. That’s a staggering rise of 65.7% year on year – but still a fraction of what Google and Facebook will earn from their own display ad businesses. Amazon is seen by many as the biggest challenger to Google. 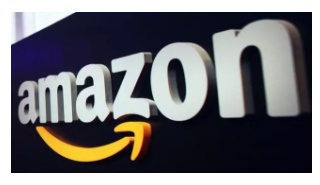 Famous for its e-commerce and Amazon Web Services business, Amazon is reportedly working to improve its offering to advertisers. There are suggestions that Amazon will serve adverts and sponsored search results when users search for specific products. With 55% of all shopping-related searches starting with Amazon’s website, that’s a potentially lucrative audience that Google and Facebook don’t have access to. Amazon’s influence in digital ad industry is increasing and many industry insiders consider it as a sleeping giant. 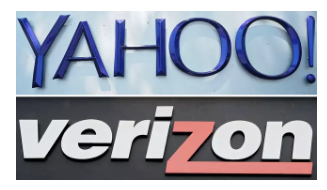 Now part of Verizon, Yahoo! was once a dominant company in search and display advertising. Acquired earlier this year for $4.5 billion, Yahoo! is set to earn $1.29 billion from display ads this year, and $1.3 billion in 2018. Add in Verizon’s other acquisitions AOL and Millennial Media, and the company will earn a total of $2.5 billion from digital advertising. That’s not bad, and Verizon will want to see revenues increasing in the future. But it’s still a long way short of challenging the dominance of the big two. Streaming media platforms like Pandora and Spotify are also transforming themselves into ad platforms. Besides selling ads directly, musicians can insert ads before and after song replays to increase their per stream earnings. 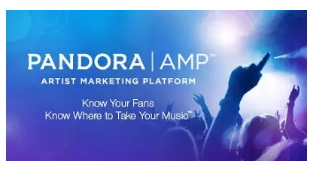 Pandora has added several new tools in its Artist Marketing Platform (AMP): Artist Audio Messages, Featured Tracks, providing various promotions to musicians and record companies. This has made it into quite a strong player in the mobile advertising space, with so much music now consumed on mobile devices. Despite this eMarketer predicts Pandora’s share in mobile ad market will fall from 1.8% in 2016 to 1.5% in 2019. YP Holdings, the owners of Yellowpages.com, a major provider of online yellow page services in the US and Europe, is also one of the largest digital ad companies in US. It recently tried to acquire Yahoo! before Verizon sealed that particular deal. 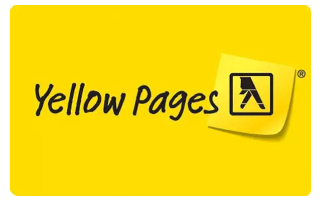 With online search eroding an already difficult market for business listings and small ads, eMarketer sees Yellow Pages share of the digital ad market falling slowly from 1.6% in 2016 to 1.2% in 2019. Yelp was founded in 2004 in California and went public at New York Stock Exchange on March 2, 2012. Its revenues mainly come from local ads, brand-led display ads and revenue-sharing on purchases and bookings made via the site. Yelp started testing a new takeaway food delivery platform this year, and announced a trial of delivery via robots would start in Los Angeles. So it’s safe to say that Yelp is not focused on digital advertising for its growth. That’s reflected in the expectation that its share in the market will hold steady at 0.6%. 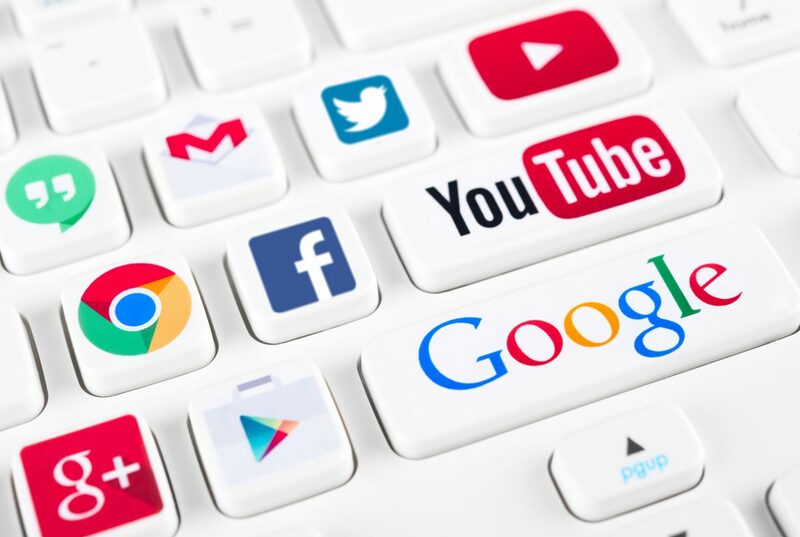 The reality is that Facebook and Google have such dominance of the digital advertising industry that it’s hard to see any existing company mounting a serious challenge. That’s not to say that there’s not room for success; even with 60% of the market off the table, that leaves $33 billion of advertising spend for other companies to compete for. And it’s also worth remembering that nothing is forever; just as there was a time before Google existed, there will be a time when another company will dominate a new approach to advertising and marketing. After all, T-Rex may have evolved to become the fiercest predator that ever lived– but that didn’t stop it becoming extinct.